China has promised around US$3 billion of finance for developing countries to cut carbon emissions and adapt to climate change, the first big commitment by Beijing on helping vulnerable nations deal with impacts of a warming climate. 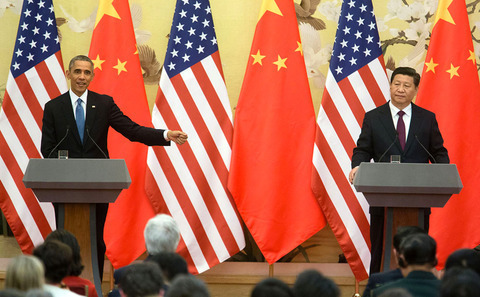 In a joint announcement by Xi Jinping and Barack Obama in Washington DC, China and US promised to take further joint action in a "common vision” aimed at delivering a meaningful climate deal in Paris at the end of this year. The agreement builds on an announcement last November through which China promised to peak its carbon dioxide emissions by 2030 or before, and the US undertook to cut greenhouse gases 26-28% from 2005 levels by 2025. Today’s announcement builds on a pledge earlier this month by US and Chinese regional governments to peak greenhouse gases and share know-how on low-carbon technologies and accounting of emissions. - The need for enhanced transparency to build trust and confidence on the implementation of carbon cutting measures, including methods of reporting and review. A White House factsheet said the US and China had made “new progress” on the thorny issue of differentiating between developed and developing countries. - The importance of a successful agreement that ramps up ambition on cutting carbon over time, pointing toward a transformation of the global economy to low carbon energy this century. - China’s confirmation that it will launch a national emissions trading system in 2017 covering power generation, steel, cement, and other key industrial sectors, as well as implementation of a “green dispatch” system to favour low-carbon sources in the country’s electricity grid. These measures would complement the recent finalisation of the US Clean Power Plan, which aims to cut emissions in the US power sector 32% by 2030. Both countries are developing new heavy-duty vehicle fuel efficiency standards, to be finalised in 2016 and implemented in 2019. Both countries have also agreed to step up their work to reduce super-polluting hydrofluorocarbons (HFCs). Analysts of climate talks said the announcement was welcome, as it cemented the US-China initiatives on climate, but cautioned that many other big emitters need to step up their efforts. "For a strong outcome in Paris, it needs more than just the US and China. Other countries must not kick back and assume a G2 (China and US) deal will keep us firmly on track for a safe climate. The voices and actions from the likes of Europe and vulnerable countries are needed to energise ambition,” said Liz Gallagher of climate consultancy E3G. China's commitment on climate finance, which matches a similar-sized pledge from the US last year, was viewed as particularly helpful to UN climate talks, given China's influence in the G77 and BRICS negotiating blocs. "It is a drastic increase from China's previous finance commitments. The scale of US$3.1 billion could potentially be even larger than the US pledge to the Green Climate Fund, which is still pending on harsh battles in Congress. said Li Shuo, a climate campaigner with Greenpeace. Li Shuo said Friday's announcement was also significant in that China had committed to 'strictly controlling public investment flowing into projects with high pollution and carbon emissions both domestically and internationally'. "This sends a strong signal that China is ready for itself and to help the world shift away from dirty fossil fuels such as coal and towards renewable energy," the Greenpeace campaigner told chinadialogue. Herz said China’s huge financial commitment also puts pressure on other developing countries. The central government has already outlined its willingness to fund low carbon energy and adaptation projects in its national climate plan (intended nationally-determined contribution or INDC) submitted to the UN in June, and at a UN climate talks in Lima last December outlined plans for a South-South climate fund. However countries most vulnerable to climate change want the world's biggest emitters to elaborate on how climate finance will be raised and spent. The world's poorest countries will also want the overall amount scaled up from the US$100 billion a year from 2020 promised in 2009 at the Copenhagen climate summit. Other provisions in Friday's joint agreement had also been referenced previously by the Chinese government but have now been given much greater prominence because of explicit mention by President Xi. China's plan to roll out carbon emissions trading had been mentioned in China's INDC, but will now have greater prominence through its inclusion in the joint agreement with the US, said Hongliang Chai, an analyst with Thomson Reuters Point Carbon. "For the first time, China's cap-and-trade is linked to President Xi". Chai added that the inclusion of Chinese proposals for a green dispatch system is a sign that the country will do more to fix problems with so-called curtailments of wind power and access for renewables to power grids.